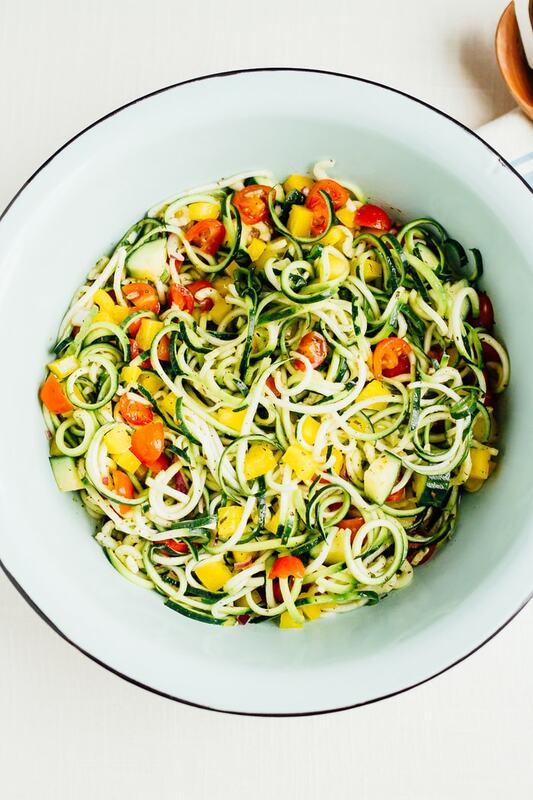 This spiralized zucchini noodle spaghetti salad is loaded with veggies and tossed in a homemade Italian dressing. Perfect for summer cookouts, BBQs and picnics! Vegan and gluten-free. Memorial Day is right around the corner. Pools will be opening, frosé will be flowing and there will be plenty of summer cookouts to attend. 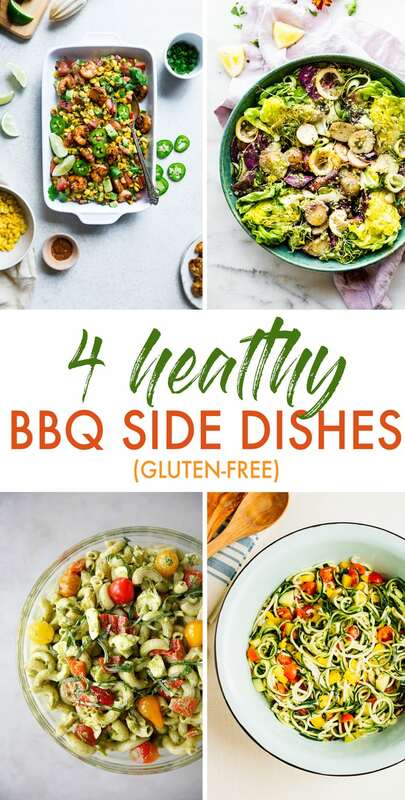 With that in mind, I teamed up with a few of my favorite bloggers to bring you four healthy BBQ side dishes. We didn’t intentionally plan this, but much to my excitement all four of us ended up making a different salad! Speaking of salads. I’m hosting a 5-day salad challenge that starts on Monday. The only commitment is replacing one meal a day with a salad. It’s such a simple change, but provides a ton of health benefits. 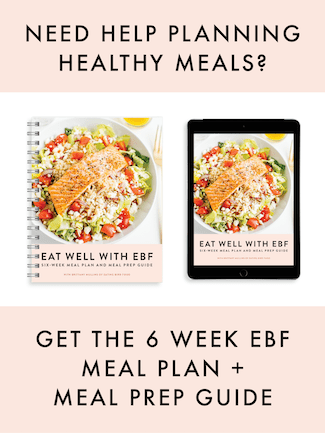 Everyone who signs up will receive a guidebook for the challenge with a 5-day clean eating meal plan, recipes and a shopping list! Plus there’s a Facebook group for motivation and accountability. You can sign up here if you’re interested. Growing up I lived for summer. It wasn’t that I didn’t enjoy school (I actually loved school), but I also really loved all the family get-togethers we’d attend throughout the summer months. Pool parties, kick ball games, playing hide-and-seek outside until sunset and then chasing lightening bugs all evening long. I have a lot of fun memories from our family BBQs. Of course, there was always a ton of food around too. Spaghetti salad was one dish my Granny used to make for every family get-together. Her version was the classic with cooked spaghetti noodles, a bottle of Italian dressing, green peppers, cucumber, tomatoes and onion. I can’t remember if her version had cheese or not, but I remember it tasting delicious. Today I’m remaking Granny’s spaghetti salad with a healthy EBF twist — zucchini noodles instead of spaghetti noodles and a homemade Italian dressing instead of the bottled stuff. It’s light, fresh and the perfect complement to hamburgers, hot dogs and other grillables! And the recipe is really flexible. 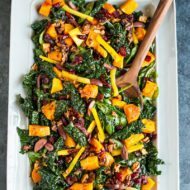 You can add whatever veggies you’d like and I’ve included some fun ideas for additional to boost the flavor if you’re so inclined. 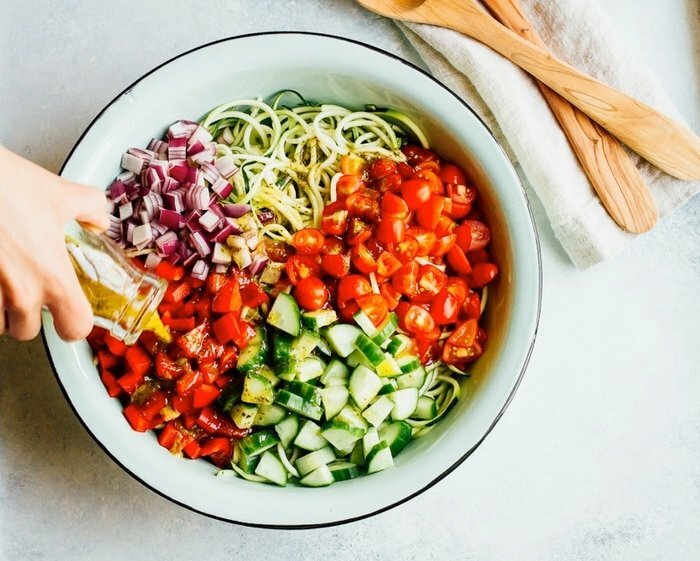 If you make this zucchini noodle spaghetti salad, please be sure to leave a comment and star rating below. Your feedback is super helpful for the EBF team and other readers who are thinking about making the recipe. 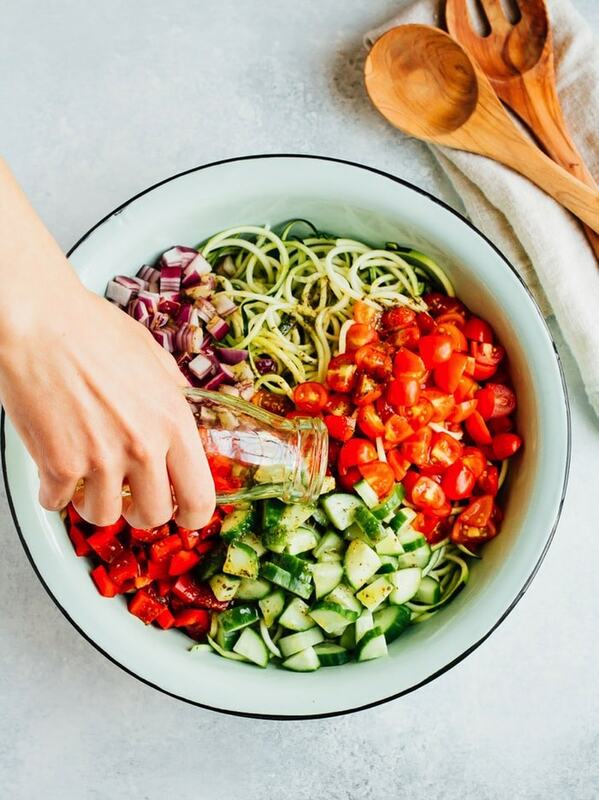 Add zucchini, bell pepper, tomatoes, cucumber and red onion into a large salad bowl. Pour dressing over salad and toss to combine. Taste and add additional salt and pepper if needed. Let sit in the fridge for 20-30 minutes before serving. Honey Lime Grilled Shrimp & Corn Salad // Food Faith Fitness — This healthy grilled Mexican corn salad is tossed with juicy, smoky shrimp and has a sweet and tangy honey lime vinaigrette! Perfect for summer cook outs! Dill Pesto Potato Wedge Salad // Cotter Crunch — This Dill Pesto Potato Wedge Salad makes a great healthy side dish for your next barbecue or gathering! Two types of salads combined and tossed a zippy dill pesto sauce. It’s gluten free, vegan friendly. Caprese Pesto Pasta Salad // Lexi’s Clean Kitchen — This one-bowl gluten-free Caprese Pesto Pasta Salad is the perfect side-dish for summer entertaining! It requires very little cooking and is simple to throw together! PLUS it is so flavorful! Add your favorite Summer greens into the pesto, toss with gluten-free pasta, tomatoes, and delicious Italian spices and BOOM: Summer side perfection. I love that I can get so many veggies in in one meal! This looks like the perfect dish paired with some grilled chicken or bean burgers, yum! Yes!! It’s the perfect salad to pair with grilled chicken or veggie burgers. I loooove how simple and delicious all these flavors are! 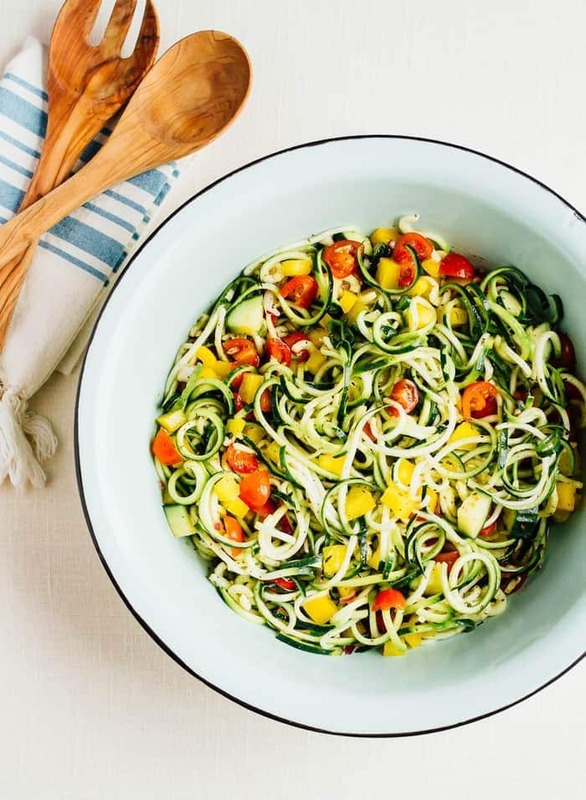 Zoodles are the best, so I can’t wait to make this! Thanks Taylor. Hope you love it! This salad looks so refreshing! 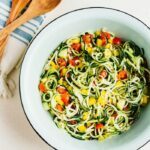 I’m a big fan of zucchini noodles and I love the combinations of veggies and the homemade dressing! Thanks Melissa. It’s really light and refreshing! 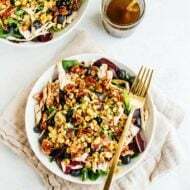 Like you said in your post, this looks like the perfect salad to serve during summer barbecues. Yum, this looks great, I love zucchini based dishes. Looks so yummy and such a great recipe to have on hand! Hi Brittany, salad looks scrumptious. If prepped beforehand, for how many days do you think it will last in fridge? (If not consumed first day) Haha ???? Haha! It should last a good 2-3 days in the fridge. i love that you reinvented Grannys spaghetti! so clever and fresh! you know i love those zoodles! Thank you, Catia. So glad you love it. This is going to be so good when our zucchini from the garden is up. Just wanted to say that this is my new favourite way to eat a whole bunch of veggies. 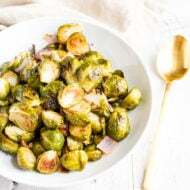 I love the recipe and thank you for sharing! Yay! This makes me so happy. Glad you like the recipe. This was my first spiralizer veggie dish, delish! My son gave it a scowl (ugh, health food) then after a taste ate most of it and asked for the recipe. It’s a keeper for sure!